Nasser Al-Attiyah has comfortably secured his third Dakar Rally crown and a first for Toyota as outgoing champion Carlos Sainz won the final stage. Al-Attiyah started the final stage of Dakar 2019 with a lead of over 50 minutes and appeared to be taking no chances in the final 112 competitive kilometres back to Lima. The Qatari brought the #301 Hilux home with the 12th-fastest time of the day in the Cars, 9:01s off Sainz’ pace, but even that was enough to win the event by 46 minutes and 42 seconds. Al-Attiyah had previously won Dakar with Volkswagen and Mini, and 2019 was his third attempt with Toyota. He led at the end of all but one stage and was already in a strong position even before the rest day which evenly split the 10 stages. “It’s fantastic. No mistakes during the entire rally. It was a very, very difficult rally for everybody,” said Al-Attiyah. “The good thing was that from Day 3 we were leading and we built on our time every day until we came to the last day with a big, big lead. “I’m really happy – thanks to Toyota, thanks to BF Goodrich tyres, all the sponsors, Qatar, Red Bull. It made everything happen right for this year. Sainz had been long out of the hunt after damage on Stage 3, and the Spaniard’s first stage win of the campaign was but a consolation. He finished 13th in the general classification in his X-Raid Mini buggy, almost 10 hours behind Al-Attiyah. It was another Spaniard in an X-Raid Mini 4×4 who finished runner-up in Nani Roma after a sixth on the final stage. The luckless Sebastien Loeb kept Sainz honest throughout the final day but missed out on a fifth stage win of 2019 by 44 seconds. After his PH-Sport Peugeot suffered multiple technical problems, and a navigation error, the Frenchman was third for the event at 1:54:18s behind Al-Attiyah. Meanwhile, Stephane Peterhansel’s (Mini, French) co-driver, David Castera, has been diagnosed with contusion of the spine but cleared of fractures after their crash on Stage 9. The modified Holden Commodore ute of Australians Steve Riley and Trevor Hanks finally went out after their own crash off a dune in Stage 6, when they were attempting to restart in the half marathon contingent due to a clutch failure on Stage 4. CLICK HERE for the Bikes report. 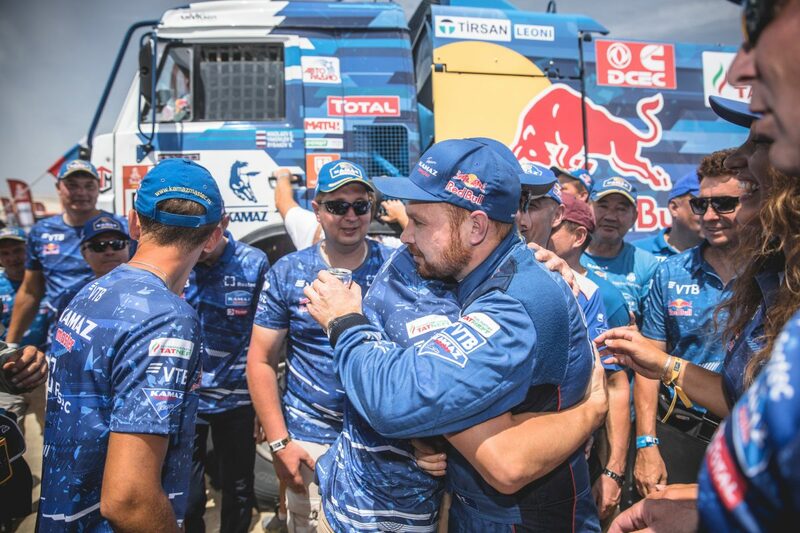 For the third straight year, Trucks has gone to the Kamaz-Master of Russians Eduard Nikolaev (driver), Evgenii Iakovlev (co-driver), and Vladimir Rybakov (mechanic). Nikolaev recovered the lead from team-mate and compatriot Dmitry Sotnikov on Stage 9, after getting stuck in the sand on Stage 8, and they finished one-two with a sixth and third in the final stage respectively. Nicolas Cavigliasso (Yamaha, Argentinean) added yet another stage win as he won Quads by 1:55:37s in the end. Australian John Maragozidis (Yamaha) was classified the last of the finishers in 15th, out of 26 starters, but picked up his best stage result of 10th in the final day. 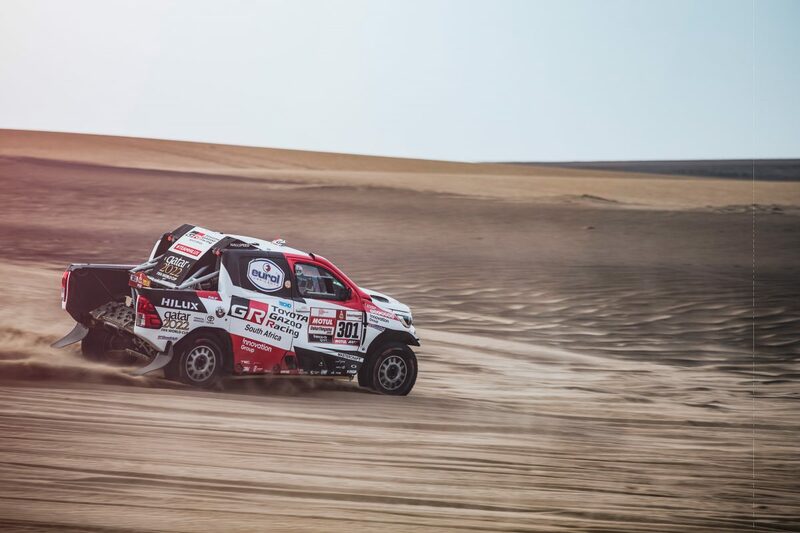 In SxS, Francisco Lopez Contardo (Can-Am, Chilean) safely made the return to Lima to win the class overall by a touch over an hour, as Reinaldo Varela (Can-Am, Brazilian) bagged the final stage.